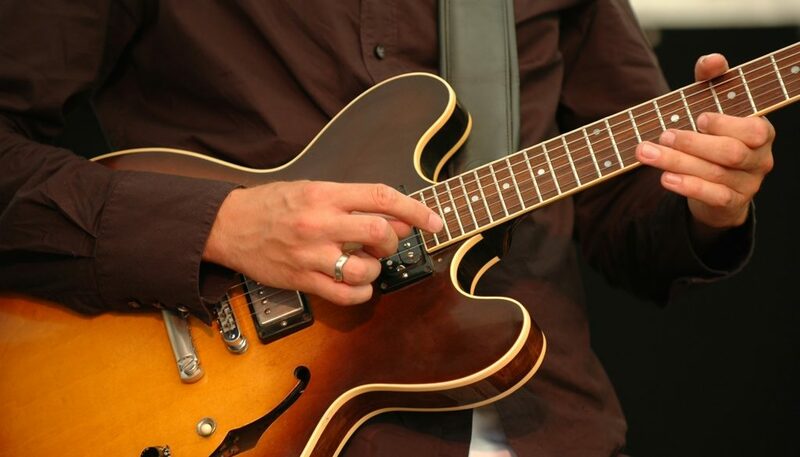 Whether you are just starting out or you’ve been playing guitar for a while, there are all sorts of things to consider when playing live music in front of others. If you think one day you’ll be playing guitar in front of other people, do yourself a favor and check out our lessons on Performing and Playing Live. What's the best way to find other musicians? Have you tried to post on college boards? There may be some amateur musicians in school that would be willing to jam. I know that’s how I played in college (some years ago!). The other good resource is a music school that teaches guitar lessons, drum lessons, etc. Students are usually encouraged to play in some kind of ensemble, so jams can be arranged with them through teachers. I’ve found that to be a great resource for me. I understand about being wary of unsavory types; always a concern. I’ve usually found most musicians to be pretty mellow, but I agree, you should be careful. Staying with schools to post (as opposed to music or cd stores) is one filter for stalker types. Have you tried posting on the Guitar Noise Gigs and Jams Forum? You may get some responses there. What are some good sound check songs? The sound check should be done with a song that’s very flexible and easy to play. It should start off easy with just the rhythm guitar, bass, and simple drums. Then add in the second guitar, and then sing a simple verse and chorus, then let the lead guitar wail for a brief solo, followed by a power instrumental chorus (everyone plays their loudest, the drummer goes wild), then end with a strong vocal chorus with full harmonies. It’s good to use a cover song. I’ll often use Feelin’ Alright because it has all the parts, and it’s not too fast. Don’t use a song like “Sympathy for the Devil” because it’s too dependent on the lyrics, and there’s not a lot of dynamics. You should pick a song that your band is willing to play early – almost a “throw away” song, but don’t blow it off. The audience is listening, and a bad sound check will haunt you for the rest of the night. And if you find a problem during the sound check, stop and fix it! For more ideas check out Scott Hysell’s lesson Sound Check in the Sound Engineering section. How do I make live vocals sound clear? I am having trouble getting vocals to come out clear to my audience. I believe I have them up loud enough they just sound muddy and are not easy to understand. My band consists of a drummer, a bass player, two guitar players, and four vocalists. I am not getting any distortion in the speakers. Is this an equalization problem? EQ is the prime cause of Muddy Vocals. You should try setting up with just a rhythm guitar and the 4 singers and sing some Crosby Stills and Nash type harmonies. Play around with increasing the EQ between 800 and 6KHz. Do this with the tone controls on the mixer set flat, only adjust your equalizer. Try doing too much so it sounds harsh or tinny, then back it down until it sounds better. It’s OK to leave it a little bright, so long as it doesn’t distort. You can then adjust each individual voice on the mixer. Be sure to check that your speakers are working correctly. There may be an attenuator on the horn/tweeter, or it may be blown out. You should be sure that you can hear some hiss from it. Last, make sure you don’t have on too much reverb. A little is good, but a lot can mess it up. If you are using a digital reverb, try making the time and depth longer, more of an echo than a chorus. For even more help on this topic check out The Soundman. How do I clear up sound troubles on stage? I think the biggest problem is that your stage volume is way too high. It’s not good if you can’t hear your own sax! But if you turn down the amps, then you’ll need to feed more of the amps through the mixer for the mains. The keyboards and the bass can go direct using 1/4″ cables, but the guitars will need to be miked. Once this is done, then you can face all of the amps in toward yourselves so you can hear each other even at lower levels. With this setup, then you should be able to get by with a simple monitor mix for the vocals. I might suggest using side-fills instead of putting the monitors on the floor. You could put a third one behind the drummer so he can hear too. Remember that the sax and guitar leads should be treated as vocals and fed into the monitors when needed. You’ll need a mixer with at least 12 channels, but your existing PA amps and speakers should be enough – you’re not getting louder! The only possible issue here is that you may be putting more of the bass guitar through the PA, so you may need an extra sub woofer and amp, but maybe not. The last issue is to make sure you have an EQ for the monitor mix. This will help prevent feedback, and make the sound much clearer. What are my sound needs for an outdoor gig? Here are a couple of quick questions, and some ideas to start. Fender and JBL make some nice all-weather cabinets. You’re going to need a good amount of power, figure 200W for every speaker, plus the sub-woofer. Plus, even though the bands are small, you’re going to need a lot of mics, because you’re going to have to mike the drums and guitars. But buy cheap ones ($50 max). You’ll need a snake and cables – can you put the mix board up on a lifeguard tower (too cool!)? OK – reality check – do you really want to “light-up” the entire beach, or just the dance area in front of the band? It gets a lot simpler when you don’t have to cover the large area. Do you have a local music store that you trust? You’re going to need one, and you’re talking about some serious bucks. Should the sound guy get paid? I am in high school and I am currently running sound for a local high school band. I love doing what I am doing because I am constantly around music. Along with running sound, I do the majority of setting up, tearing down, and I help bring equipment to the gig. However, I have been faced with a problem. The guys in the band have not paid me for quite a while. They say that all of the band’s money is going into the band’s account in order to buy other equipment. Though getting new equipment is nice, I need to get paid. I have confronted the band members about this and they tend to use my love for what I’m doing against me and tell me not to complain. I feel that I am getting ripped off and used. I am also going to be getting another job soon, and it makes no sense to take time off a job where I will be actually getting paid to work for these guys and not be guaranteed the money. Should I have them sign a contract even though they only pay me $25 dollars a gig??? I would GREATLY appreciate your opinion on this. Thank you! Wow, you’ve got an interesting problem. If no one else in the band is getting paid, then that makes it even more difficult. Who keeps and manages the money? On the plus side, you are an energetic sound engineer who loves the music and cares how it sounds. These characteristics will serve you well. Since no one is getting paid, then you should all be “equals”, which means that everyone has to help load in, set up, and tear down. The PA and the drums get set up first, and no one plays their guitars until the initial sound check is finished. When possible, you should go to rehearsals, and provide some creative input about dynamics, tone, etc. With regard to your options going forward, you’ve got a couple of choices. First, if you want to get paid even if the others don’t, then you need to act like a hired gun. This means that you are no longer equals: they are the talent, you are the sound guy. You are responsible for the equipment, and you have to treat it as if it was your own. You’ll have to get to the gigs early and set up alone. In fact, it would be best if you got your own PA . On the plus side, you could then work for other bands too, and you’d be surprised how many bands really need a sound guy out front. Either way, you get paid. If you want to stay with the band, then you should at least have a say in how the money is managed, and what equipment is bought. The band shouldn’t buy anyone personal gear like guitars or strings, but any PA gear can be owned by the group. If there are 5 of you, and you make $300 for one night, then maybe $200 goes in the bank, and each of you gets to keep $20 cash. Also, what happens when one of you leaves the band. Say you’ve earned $5000 over the years, and spent $4000 on PA upgrades. What happens after senior year? Who gets to keep the PA? How much does that person have to pay the others? This gets very tricky. But you can look at it simply: if you are considered a member of the band, then you should have a say in how it’s run, and be treated as an equal. If not, then you’re on your own whether you realize it or not. Feel free to share this with the band and your parents. These are the kinds of business issues that you can talk with them about (as opposed to your respective taste in music). Can I use a laptop for live recording? A laptop won’t be sufficient for good recordings, as you will need a first-class digital converter. I would recommend one of the new Korg or Fostex digital recording stations. They have excellent mic pre-amps and digital converters, as well as useful EQ and effects. Some models have CD-ROM burners installed, or you download the data over to your PC. There are small 4-6 channel units, as well as 12-24 channel workstations. Don’t forget that you will need permission from the artists to record them. Performance rights is the right to income from public performances of your work. There are three big performance rights organizations: BMI, ASCAP, and SESAC. They each license venues and promoters to publicly perform anything in their catalog. For more information on the different types of music rights, have a look at our FAQ What is the deal with music rights?